Enticing floral aromas with refreshing juicy dark fruits and a tannin-free finish. Great with lighter meats – pork, chicken or charcuterie. Having arrived back from holiday, with delayed flights and lots of waiting around, I grabbed a bottle of this to drink with a hastily-prepared dinner of chops and salad. It was delicious. 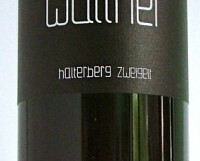 Zweigelt can be the Beaujolais of Austria, light refreshing and very gluggable. There are some winemakers who try a little too hard, ageing it in new oak barrels and extracting heavy tannins. To me that misses the whole point; Zweigelt is there to be drunk and enjoyed for its pure free-flowing fruits. Available from Red Island Wines, Skerries; Listons, Camden St.; On the Grapevine, Dalkey, Cabot & Co. Westport.